Warm and comfort your soul this winter with an earthy mushroom lasagna. Pair delicious pinot noir wine with each bite for a perfect family or entertaining dinner! Full of flavor with wonderful richness, this lasagna is the perfect vegetarian dish. 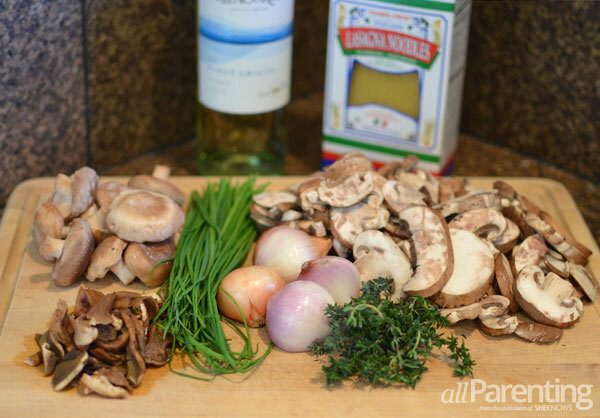 The use of three different wild mushrooms adds a tremendous depth and flavor to the lasagna. Throw in some cream cheese, reserved mushroom liquid, a béchamel sauce and fresh herbs and you have a spectacular meal. Use no-boil lasagna noodles for added ease and to save time. 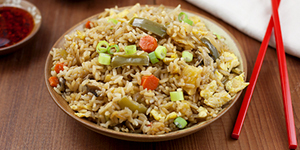 Perfect for entertaining close friends or for an extra-special weeknight dinner. 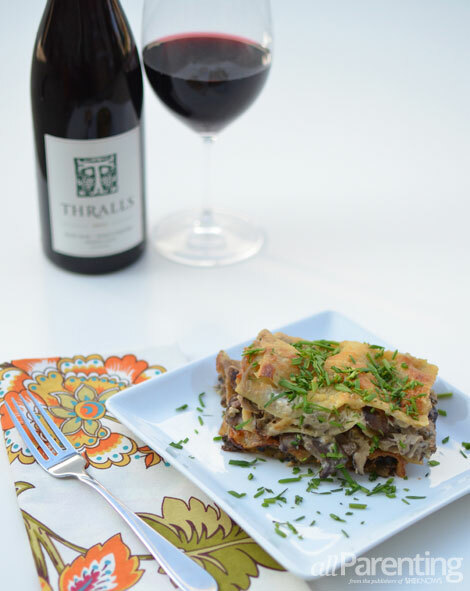 Thralls Pinot Noir from Roma’s Vineyard in Anderson Valley is the perfect wine to pair with this lasagna. The wine is savory with mushroom and umami characteristics, making it a wonderful pairing with mushroom lasagna. In a small bowl, combine dried porcini mushrooms and boiling water. Cover and let stand for 30 minutes. Strain mushrooms, reserving liquid. Set mushrooms and liquid aside. In a large saucepan, melt butter. Add 1 tablespoon of olive oil and shallots. Sauté for 5 minutes until softened. Add crimini and shiitake mushrooms and sprinkle with salt and pepper. Sauté for 8 to 10 minutes. Add thyme, 1/2 of the garlic and wine. Sauté until liquid evaporates. Remove from heat. Stir in cream cheese, chives and porcini mushrooms. Set aside. In a pot, add olive oil and the remaining garlic. Sauté for 1 minute and then add reserved mushroom liquid and 2 cups of milk. Sprinkle in salt and pepper and bring to a boil. In a small bowl, combine 1 cup of milk and flour. Whisk to combine and then add to pot. Whisk constantly until sauce thickens. Cover the bottom of an 8 x 8-inch baking dish with sauce. Lay 3 lasagna noodles down and then spoon some of the mushroom mixture over the top. Add 1/2 cup of white sauce, followed by 3 more lasagna noodles. Repeat layering, ending with Parmesan cheese on top. Bake in oven for 45 minutes and until cheese is crispy and golden brown on top. Remove from oven and let sit for 10 to 15 minutes. Slice into pieces and transfer to plates. Garnish with more snipped chives. Enjoy!